This A2 ESL lesson plan contains practical activity and game ideas for teaching elementary level students(A2) how to ask questions about the future. As always, our ideas and lesson plans require minimal resources(markers and a whiteboard). If you use an iOS or Android device, don't forget that you can get offline access to these materials, along with a much more extensive selection of ESL lesson plans, through the TEFL Handbook app. 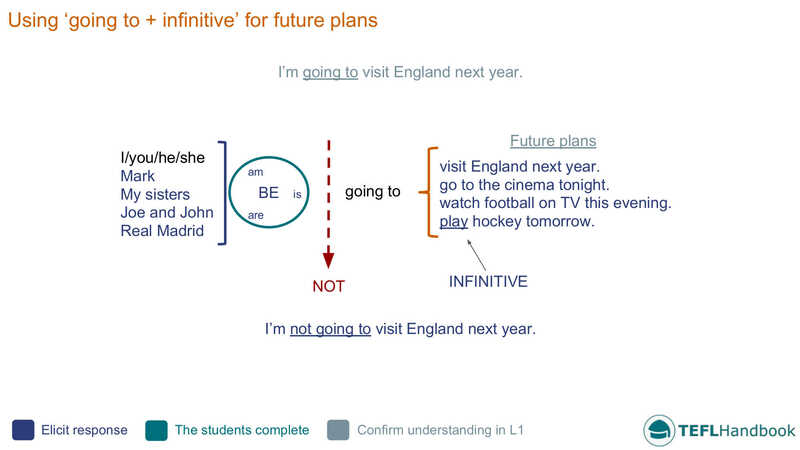 The sample board below assumes that the students have prior knowledge of talking about the future using going to + infinitive. 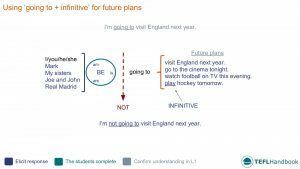 Start off by adding a couple of going to + infinitive statements to the board and having the class attempt to form questions from them. After that, elicit some example short-form responses. Finally, run through a few Wh- questions and explain how they change the meaning of these questions. Are you going to...this weekend? The students will now make 3 - 5 Wh- questions using the new time expressions. Once they have finished, they can use these questions to interview their partner about their plans. The students should record their partner's answers for the next activity. Teacher: What was your second question? Student A: Where are you going to go on holiday this summer? Teacher: And where is he going to go? Student A: I’m going to watch a movie. Student B: Are you going to the cinema? Student A: Yes, I am. Other places: Beach, sports centre, train station, football stadium, London, supermarket, library, theme park, your bedroom, a restaurant, a park. If you've found these ideas useful, be sure to check out our complete list of ESL lesson plans for elementary level students, A2 lower and A2 upper. For other levels, see the entire collection of ESL lesson plans. Also, iOS and Android users can access all of our materials through the TEFL Handbook app. An ESL lesson planner for English teachers.